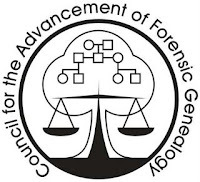 Council for the Advancement of Forensic Genealogy is pleased to announce they will offer two courses at the 2014 Forensic Genealogy Institute at the Wyndham Love Field Hotel in Dallas, Texas. "Foundations in Forensic Genealogy" will be held from Monday 24 March through Wednesday 26 March 2014. Foundations is designed as a basis for the study of forensic genealogy. It assumes the student has an intermediate or advanced level of understanding in genealogical research and explores the forensic genealogy landscape, application of forensic genealogical techniques to research, and career paths available to forensic genealogists. It is a prerequisite course of study to the advanced level courses. "Advanced Forensic Evidence Analysis" will be held from Thursday 27 March through Saturday 29 March 2014. 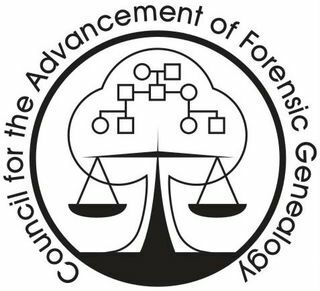 New in 2014, this year's Advanced program will explore in-depth a number of applications of forensic genealogy to include the development and use of DNA in solving forensic genealogy problems, the repatriation process of military remains presented by the U.S. Department of Defense, forensic genealogy in mineral rights cases, and forensic document analysis. These topics, along with others being formulated, will be "hands on" discussions, case studies, and workshops. Registration procedures for early application are open to the general public. Hotel accommodations and further information about the Institute may be found on the Forensic Genealogy Institute website at http://www.forensicgenealogists.com/forensic-genealogy-institute.html Persons wishing to attend are encouraged to secure their hotel reservations now via the hotel link on the website due to sporting and other events scheduled in the Dallas area.